^ Obituary Variety Obituaries, 1982-9-1. ^ a b c d e f g h i j k l m n o Chandler, Charlotte (2007). Ingrid: Ingrid Bergman, A Personal Biography. New York: Simon & Schuster. pp. 21; 294. ISBN 0-7432-9421-1. 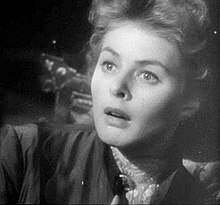 ^ The Official Ingrid Bergman Website. ^ Marton, Kati (2006). The Great Escape: Nine Jews Who Fled Hitler and Changed the World. New York: Simon & Schuster. p. 176. ISBN 978-0-7432-6115-9. LCCN 2006-49162. OCLC 70864519. ^ a b "Steve Allen". The Mike Wallace Interview. ABC, New York City. 1957年7月7日放送. 写し. ^ a b c Spoto, Donald. Notorious: The Life of Ingrid Bergman, HarperCollins (1997), Intro. Radio rich media may be found in the radio credits table.